Vector Displays offers an extensive selection of quality carpet in 19, 29, 32, and 50 oz. sizes. We can also provide optional inlayed carpet designs for your trade show exhibit. These designs can include your corporate name or logo. If we do not have the color you want in stock, we have the ability to custom order your chosen color for an additional fee. This Rollable Bamboo flooring is manufactured in convenient 5 foot wide x 10 foot long rolls. It is available in 5/8 inch wide and 1/8 inch thick slats, and inch wide x 1/4 inch thick slats. Each 5 foot x 10 foot roll weighs less than 25 pounds. 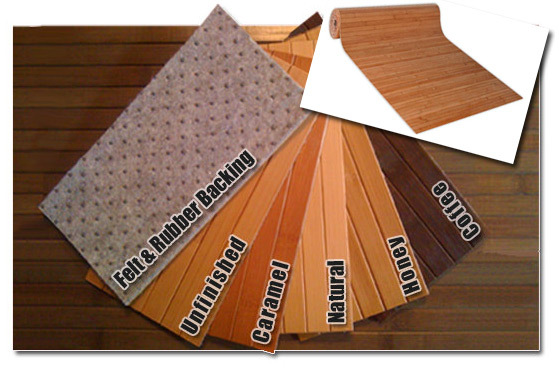 Our Rollable Bamboo flooring is easy and inexpensive to ship and install. It is also made with renewable and recycled materials. This product can be shipped by FedEx or UPS. The rolls have a diameter of 6 inches and each 5 foot x 10 foot section is shipped in a 5-foot long x 8-inch diameter cardboard tube with end caps. Our 5/8 inch wide x 1/8 inch thick slats are available in the four colors shown above as well as an unstained option. Treat your trade show exhibit visitors and staff to extra comfort by adding our Rebond® 1/2" padding under your trade show exhibit carpet.